In a small bowl mix together flax seeds and chopped pecans and/or almonds, reserve a teaspoon for garnish. Blend tofu and maple syrup, reserve a dollup for garnish. 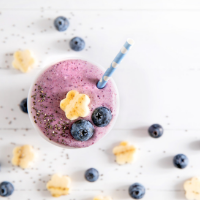 Blend the almond flax seed mixture (saving some for garnish), the tofu mix (save some for garnish) with the remaining ingredients of frozen Wild Blueberries, fresh strawberries and almond milk until smooth. 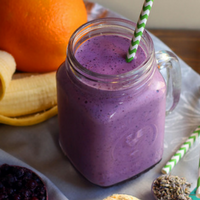 Pour into smoothie glass and top with garnishes, sip and enjoy!